FILE - An Oscar statue appears outside the Dolby Theatre for the Academy Awards in Los Angeles, Feb. 21, 2015. The Oscars still don't have a host, but on Tuesday morning, they'll at least have nominees. The Academy of Motion Pictures Arts and Sciences will unveil nominations to the 91st Oscars on Tuesday at 8:20 a.m. EST from the Samuel Goldwyn Theatre in Beverly Hills, California. The nominations, to be announced by Kumail Nanjiani and Tracee Ellis Ross, will be livestreamed globally at Oscars.com, Oscars.org and on the academy's digital platforms like Facebook, YouTube and Twitter. The lead-up to Tuesday's nominations has been rocky for both the film academy and some of the movies in contention. 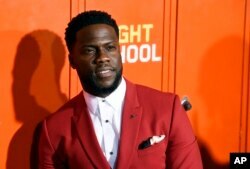 Shortly after being announced as host, Kevin Hart withdrew over controversy surrounding years-old homophobic tweets that the comedian eventually apologized for. That has left the Oscars, one month before its Feb. 24th ceremony, without an emcee, and likely to stay that way. Hollywood's awards season has been an especially combustible one, too. Some contenders, like Peter Farrelly's Green Book and the Freddie Mercury biopic Bohemian Rhapsody, have suffered waves upon waves of backlash, even as their awards tallies have mounted. On Saturday, Green Book won the top award from the Producers Guild, an honor that has been a reliable Oscar barometer. In the 10 years since the Oscars expanded its best-picture ballot, the PGA winner has gone on to win best picture eight times. The season's steadiest contender — Bradley Cooper's A Star Is Born — looked potentially unbeatable until it got beat. Despite an enviable string of awards and more than $400 million in worldwide box office, Cooper's lauded remake was almost totally ignored at the Golden Globes, winning best song but losing best picture, drama, to the popular but critically derided Bohemian Rhapsody, a movie that jettisoned its director (Bryan Singer) mid-production. Still, A Star Is Born (the sole film to land top nominations from every guild award except the Visual Effects Society) may be the lead nomination-getter Tuesday with around 10 nominations including best actress for Lady Gaga and both best director and best actor for Cooper. But other films, including Ryan Coogler's Black Panther, Alfonso Cuaron's Roma and Yorgos Lanthimos' The Favourite, could be in for big mornings, too. FILE - Anthony Rossomando, from left, Andrew Wyatt, Lady Gaga and Mark Ronson pose in the press room with the award for best original song, motion picture for "Shallow" from the film "A Star Is Born" at the 76th annual Golden Globe Awards in Beverly Hill, California, Jan. 6, 2019. ​How many will there be? Best picture nominees can fall anywhere from five to 10. Most commonly, we end up with nine nominees, as there was last year when Guillermo del Toro's The Shape of Water ultimately prevailed. Most assured of a spot are the films that have fared well consistently with Hollywood's guilds, whose memberships overlap with the 17 branches of the academy. The five films picked by the strongly predictive Directors Guild — BlacKkKlansman, A Star is Born, Roma, Green Book and Vice — are probably in. So, too, are The Favourite and Black Panther, leaving films like Eighth Grade, First Man, A Quiet Place and Bohemian Rhapsody vying for a place. FILE - Mexican actresses who star in the Mexican film "Roma," Yalitza Aparicio, from left, Marina de Tavira and Nancy Garcia, pose on the red carpet in Mexico City, Nov. 21, 2018. Roma, Cuaron's black-and-white memory masterwork, is poised to hand Netflix its first best picture nomination — something the streaming service has dearly sought. Amazon got there first in 2017 with Manchester by the Sea but Netflix came close last year with Dee Rees' Mudbound. This time around, it has gone against its regular policies to release Roma in select theaters shortly in advance of arriving on Netflix. If Roma, which is Mexico's foreign language submission, were to win best picture, it would become the first foreign language film to ever win in the category. Cuaron, who served as his own director of photography, is expected to be nominated for both best directing and best cinematography. If he were to win best director, he and his Three Amigos countrymen — del Toro, Alejandro G. Inarritu — will have won the category five of the last six years. 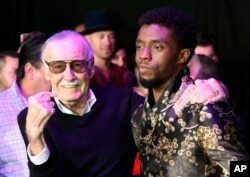 FILE - Comic book legend Stan Lee, left, creator of the "Black Panther" superhero, poses with Chadwick Boseman, star of the new "Black Panther" film, at the premiere at The Dolby Theatre in Los Angeles, Jan. 29, 2018. Coogler's superhero sensation sold more tickets ($700 million worth) than any other film in North America in 2018. It has thus far won some honors here and there, but Black Panther may emerge as a major contender Tuesday. Coogler's film could be well represented in the craft categories, including visual effects, production design and costumes, along with Kendrick Lamar's All the Stars in the best song category. Black Panther could make history in one other way, too. A best picture nomination would be Marvel's first. FILE - Spike Lee, director of the film "BlacKkKlansman," poses after the closing ceremony of the 71st Cannes Film Festival, Cannes, France, May 19, 2018. ​Will Spike Lee land his first directing nomination? Spike Lee has been nominated twice before, for writing 1989's Do the Right Thing and for best documentary (1998's 4 Little Girls). The 61-year-old filmmaker has even been given an honorary Oscar by the film academy, in 2015. But this year, Lee is favored to earn his first directing nomination for his impassioned white supremacist drama BlacKkKlansman. A year after Greta Gerwig became just the fifth woman nominated for best director, all of this year's favorites are men. Whether someone like Debra Granik (Leave No Trace) can crack the category this year or not, it will be a different academy voting. In the last few years, the academy has considerably increased its membership in an effort to diversify its ranks, which have historically been overwhelmingly white and male. In June, the academy invited a record 928 new members. FILE - Kevin Hart poses at the premiere of the film "Night School" in Los Angeles, Sept. 24, 2018.